February 12 @ 7:45 AM: Chicken tikka masala that we put in between garlic naan and made into a sandwich for breakfast. April 2 @ 11:55 AM: Spicy coconut shrimp ramen. June 22 @ 2:12 AM: A handful of nacho-flavored goldfish crackers followed by a cherry/cola mixed Slurpee. August 7 @ 1:15 PM: Stacy’s lunch (Thanks Stacy). October 13 @ 6:45 PM: A sushi roll made with steak and caramelized onions. November 16 @ 8:55 PM: A cheeseburger on a pretzel bun. Say whatever you want about this year, you can’t deny it had its food moments. So prepare for 2018 by using this code to relive your favorite orders on the app that pops jalapenos. You’re the taco to our dip. **Before we get to rules, a tribute to perhaps the greatest part of 2017: Salt Bae. You filled our year with laughter, happiness, and sodium. You impressed us with your knife skills, sunglasses, and your casual white deep V-neck. You sprinkled your way into meme history and seasoned a piece of our heart forever. To you Salt Bae, a toast of Himalayan pink sea salt. Now on to the lawyers: This $2 coupon expires on Monday, January 1st 2018 at 11:59PM Pacific Time. You must have an Eat24 account to use our code, which can only be used once on an order with a total over $15 before tax and tip when paying with Credit Card, Apple Pay, PayPal, or Pay with Google. 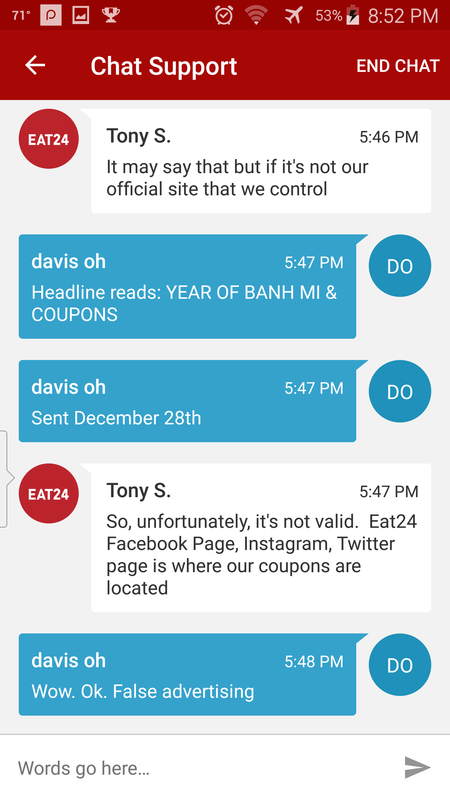 The coupon is valid only on Eat24.com or the Eat24 app. What will 2018 bring? Pepper Wife? Bay Leaf S.O.? Cayenne Partner? Only time will tell. Inspirational Quote for the Weekend: To a new year, new resolutions, and new quesadillas. Coupon worked for me! Try again!